Welcome to Prose: A social network that could just revitalize the literary spectrum as we know it and create a more rewarding experience for both readers and writers alike! I could wake up in the middle of the night or be walking down the street and an inspiring thought to write the next prize winner could be within my grasp. It could be a casual observation; words to a poem; a phrase or item that caught my attention and stimulated my creative juices — but I wanted to write it down quickly, cleanly and get it out to the world at large. In March 2014, another professional writer — frustrated with similar limitations — decided it was time to try and resolve this dilemma. What if there was a social network that provided creative and enthusiastic readers and writers — professional or amateur — the opportunity to write more in less time; get feedback; share ideas; discover writers with matching literary tastes; and connect and mutually inspire? In October, Prose was born. Prose levels the playing field for all writers. One of the unique and stimulating aspects of Prose is a new form of creative competition: Where readers come up with a topic, write about it and then compete with others for the best way to publish their thoughts. You rise in rank among the readers/writers of Prose and the competitions give you more visibility. “Prose, unlike any other reading/writing platform, incorporates subtle game mechanics through both ‘challenges’ and ‘levels.’ Anyone can create a writing challenge that prompts any kind of writing, then invite anyone to participate,” Augustine said. “Whichever response gets the most likes after that challenge expires is crowned winner. This writer then acquires a number of ‘points’ equivalent to the total number of likes on all responses to the challenge. Prose then takes on the form of a personal blog, social medium, all in one convenient click. Following Prose can add to a writer’s creativity and ability to prove that writing and reading is a passion that remains vibrant in a mostly digital world. And, it is beginning to click. For my first full disclosure of this post: I did not write the above quote. It was written by a much greater writer than I: Ralph Ellison. But that’s for later. Yes, my fellow readers plagiarism is an art. It has to be if the plagiarist can be artistic enough to get away with one of the most egregious acts of theft: To me there is nothing lower than stealing someone’s words or intellectual property and calling it your own. In a way, with the Internet, blogs and hundreds of publishing platforms it becomes tempting, almost inevitable and very easy — unless you have a sense of ethics. And, I am not here to make specific accusations — though I could, because I am seeing a growing number of instances. So what exactly is plagiarism when it comes to writing? We all know what it was called in college when you either lifted a paper written by someone who took the course before you, or found a paper or dissertation in a long-forgotten source. We have all heard of instances where newspaper or magazine ombudsmen — or “social editors” as some are now called — have either caught the guilty or been alerted to the practice by astute readers. The bolding is my own. It is the “closely imitating” that seems to have overtaken a lot of posters and bloggers. For the sake of full disclosure: I am not the first to notice this problem. Search the Internet and you will find numerous programs, for multiple categories, which give the publisher the opportunity to see if the item written — or parts of it — have been used before. I can say I have never engaged in this evil art myself. I would rather clean hotel bathrooms first. Then again — and not to belittle those who have to clean bathrooms — there is a distinct similarity. As a matter of fact, there is more honor in honestly doing a day’s work. So, if you have nothing new to say or write, have the dignity and self-respect to admire the writer’s words. Quote them, attribute them, but don’t use them as your own. You eventually will get caught — and after that you might as well go clean toilets. 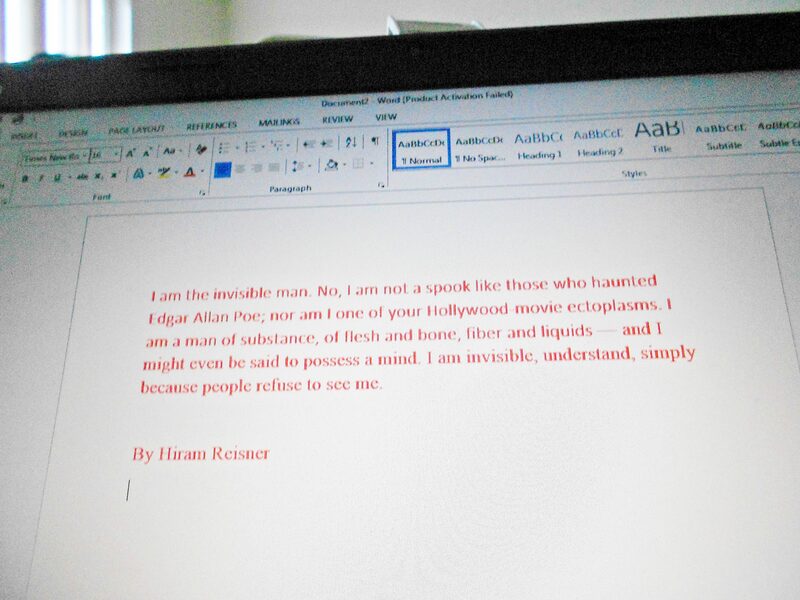 By the way, the quote in the lead image is from brilliant writer Ralph Ellison’s “Invisible Man” — a book which I have read several times and quoted from, always with attribution. I have spent my entire career “writing,” mostly as a serious journalist. Whether as a reporter, editor or manager, it all involved the skill of writing. For years I have wanted to write a novel — as the old saying goes, every journalist has two chapters of a novel languishing in his bottom drawer. But there has been an invisible wall that always prevented me from going forward. I have watched colleagues break through the wall and publish successful, well-received, quality literature. I even have seen several become quite wealthy from their endeavors. I didn’t have the courage to write. Keyes presents the fear of writing as a positive impetus to push yourself beyond what you consider your personal limits — a challenge to overcome a phobia, just like any other. So, why is it so personally difficult for many writers to get up the courage to write — and more than that to attempt to get their words published? The lack of courage to share one’s words even has several names: The most common is Scriptophobia — the fear of writing in public. It used to mean literally the anxiety experienced when writing on a blackboard or even filling out a job application, but it has evolved to include making your writing public. This fear does not just apply to writers of novels. It extends to non-fiction, poetry — even blogs. As noted, the fear is easily explained; overcoming it is much more complex. Procrastination; when will I find the time as the act of writing itself (for most) does not pay; what if I fail: What if no one cares what I have to say. I had become an expert at using all these excuses. But I finally feel that the fear is gone and I now have both the intestinal fortitude and discipline to proceed. Encouragement from colleagues has been a major factor. So has a subtle realization that if not now, then when. But here is why I no longer lack the valor of a mountain climber and why I am tackling the project. Simply put: Because it’s there. Less trite, I have learned that the fear is shared by many — from the most successful to the ultimate novice. If I don’t — who will? As a final note: When it does come out, please buy my book?